Robin Widdows' first love was bobsleigh, and he represented Great Britain in the two and four-man bob at the 1964 and 1968 Winter Olympics. He was also the holder of the record for the fastest time on the famous Cresta Run in 1965. He filled in his time motor racing, initially in an MG Midget and then in a Lotus 23. In 1966 he switched to a Brabham and entered Formula Three where he proved successful enough for him to graduate to the World Sports Car series. In 1967 he ran his own F2 team, backed by friends, known as the Witley Racing Syndicate and they won the non-championship race at Hockenheim. 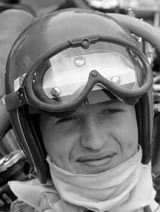 He moved to the Chequered Flag team in 1968 with less to show for it, but in between that and sports cars, he also made his only Formula One appearance when his Cooper-BRM was forced to retire with ignition failure at the British Grand Prix. He continued to race continuously in F2, sports cars and Formula 5000 until he quit in 1971. He later joined Moet et Chandon and in the 1990s returned to F1 as the company's representative. "One of the biggest challenges was that I knew nothing about champagne, didn't speak much French and the President insisted that no-one speak to me in English," he admitted.